Blog | Revealed! E-commerce Conversion Rates! Are you very happy with the amount of traffic in your online store and think its doing good business? Think again! In e-commerce, traffic to your website alone is not enough to assess the success of your enterprise. Because not only do you want traffic to your website but also turn those passive visitors into paying customers. Imagine, you see about a thousand visitors to your website in a month but only make ten sales, is that good for your business? No. To make the right assessment of your online store or website you need a metric that assesses the number of visitors to your website as well as the number of sales generated. This metric is popularly known as the Conversion Rate. Conversion Rate is the ratio of a number of visitors to your online store to the number of sales in a particular period of time. 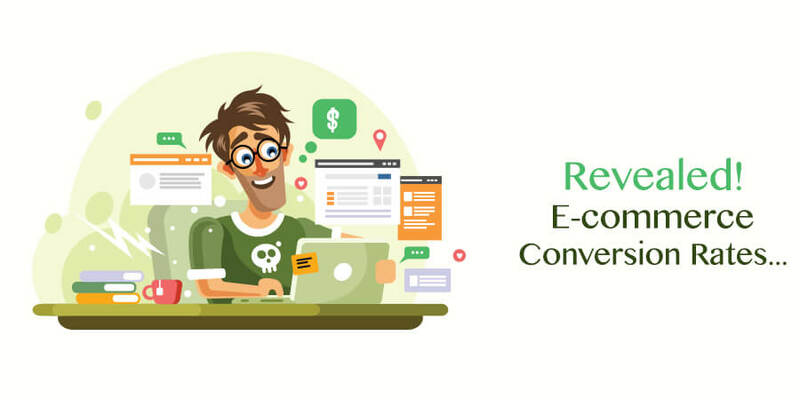 Conversion Rate strongly correlates web traffic to revenue and profit generated and helps you grow your store effectively. So if you see that out of 100 visitors to your online store, 1 customer performs a checkout and buys something, your Conversion Rate will be 1%. The better the Conversion Rate, the better your business! All your marketing efforts made through Facebook, Google Adwords, emails or other ad campaigns can be tracked and assessed to measure their Conversion Rates individually. Take a look at how the average conversion rates generally look for top companies and mediocre companies. So, what does the Conversion Rate depend on? Several different factors. Conversion Rate depends on the type of product, where it is being bought from, where the customer is located and most importantly, the price. Price of products has a huge impact on Conversion Rates. Consumers are real people and behave differently. The need, the time, the location, the quality, the price as well as, the payment process can all make a big impact on the sales, as every consumer may have a different criterion for buying your product. Before answering this question, what is important is that you compare your business with others that are similar to yours. Look at their business models, marketing strategies and what platform they are using majorly. There are many factors that can influence Conversion Rates such as web store appearance, product type, acquisition channel and price amongst others. To help make sense of what is a good Conversion Rate in a niche of business, it is generally broken down into different dimensions for better insights. Take a look at the table again. These benchmarks may be useful in understanding where your store is ranking and how your business is doing amongst others similar to yours. Another important point to look at is the product type where your business fits in. Commonly, products in categories of food and drinks, or health and beauty have higher Conversion Rates than say, furniture or electronics. Overall, email marketing has been seen to have the highest Conversion Rate while for visual products like those in fashion, health and beauty, Facebook is popular. The takeaway is that, understand the most important factors influencing Conversion Rate in your business type by comparing with close competitors and then assess where you stand amongst them. Increasing your Conversion Rate by tweaking your marketing strategies and acquisition channels can help you scale your business better and make marked improvements in your revenue and profit!